An optional Full Function Wireless Remote Control System with 7 different functions allows for jetting operations away from the unit. The Operator working inside of a building or basement has fingertip controls of the jetting unit without the need of two-way radio communication with an Operator stationed at the jetter’s control panel. When using the Mongoose Full Function Wireless Remote Control System, a second operator or worker should always be posted at the unit. Safety precautions must always be taken to prevent passersby and curious children from tampering with an unattended operating jetting unit, a situation that could lead to an accidental injury. The wireless remote control has a built-in communication safety link. If the handheld unit loses contact with the jetting unit’s transmitter, the engine on the jetting unit will automatically shut-off. Tests have proven the Full Function Wireless Remote Control System to be reliable up to 800 feet with obstacles or 1500 feet with no obstructions. 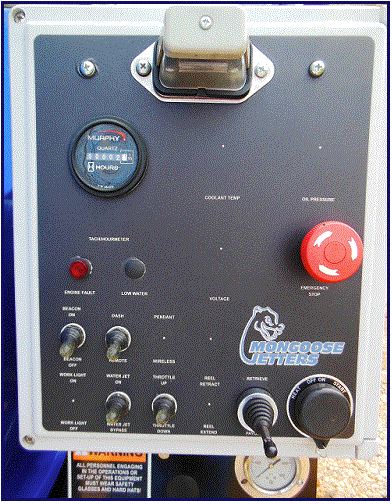 A weatherproof Nema 4 control panel is standard equipment on all Mongoose Jetters. All switches and controls are waterproof tested. The interior of the NEMA 4 control panel provides plenty of space for easy access for maintenance or trouble shooting, with or without an optional wireless remote control system. All of the interior electrical components can easily replaced in the field if necessary. There are no PC boards used in the control system panel. The Control panel monitors all engine functions; hydraulic reel in/our; high pressure water on/off; engine ignition key switch; engine throttle- water pressure up/down; emergency stop switch; engine hour meter; safety beacon light and wireless remote control activation switch. Caution: Operators should always be in view of the unit when using the Hydraulic Hose Reel in/out function. Refer to the Mongoose Jetters Owners Manual for specific operating instructions. 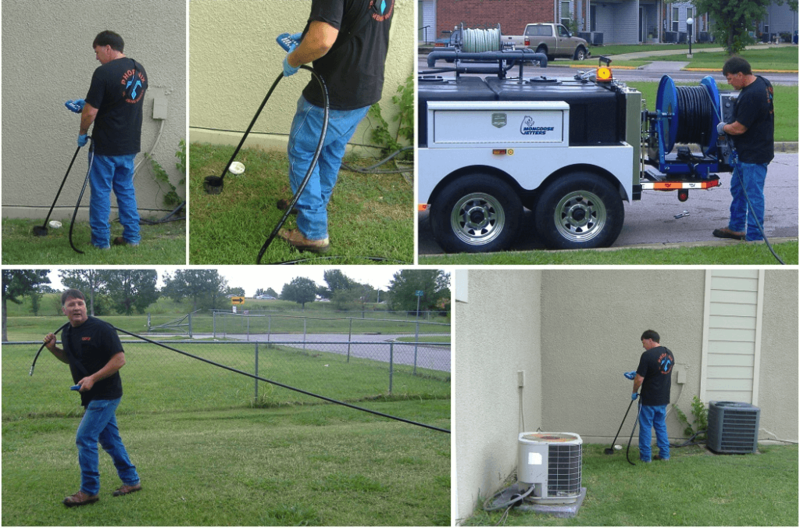 The Mongoose full function wireless remote control system is used to clean a sewer line from manhole to manhole. The operator starts the jetting process from the downstream manhole then can remotely operate the jetting unit from the upstream manhole. This allows the operator to observe & control the nozzle entry into the upstream manhole.